A team of mechanical engineering students from the University of Bath has designed and raced a vehicle able to travel a distance that’s the equivalent of travelling from Bath to Boston (USA) on a single gallon of fuel. 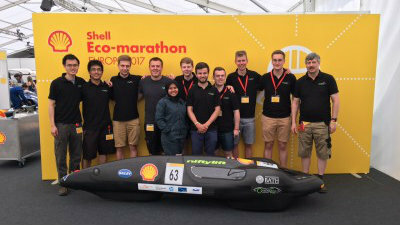 Green Bath Racing has just competed at the Shell Eco-marathon competition at the Queen Elizabeth Olympic Park in London in which vehicles must complete a 10 mile course using the smallest amount of fuel possible. The Bath students competed against 74 teams from across Europe, coming 8th overall and retaining their title as the top UK team with their vehicle having achieved an impressive 3,112 miles per gallon (mpg). When competing at the Shell Eco-marathon competition, cars must maintain an average speed of 15 mph and complete the hilly 10 mile course in no more than 39 minutes. The vehicle must only be powered by a petrol engine and receive no human or electrical assistance, with its driver weighing over 50kg. The fuel economy of each car is calculated by filling up each vehicle’s 30ml fuel tank before completing the 10 mile track. Once the course has been completed, the fuel used is measured by re-filling the tank and recording how much fuel has been used over 10 miles. The Green Bath Racing vehicle is not like an everyday car: the key differences being the vehicle uses three bicycle wheels; the driver controls the car in a reclined position, must be shorter than 5"4’ and as light as possible; and the range of the vehicle is limited by the 30ml fuel tank to approximately 20 miles. Green Bath Racing first started in 2015 as part of students’ third year group design projects to design a vehicle to comply with all regulations set out by Shell for their Eco-marathon competitions. In their final year, the students manufactured their vehicle and in 2016 raced at their first Eco-marathon competition, achieving an impressive 1,316 mpg and the position of top UK team. Spurred on by their predecessors’ success, this year’s students have continued Green Bath Racing, making numerous modifications to the vehicle. The car is powered by an updated 4-stroke, single cylinder petrol engine which uses bespoke valve timings and an advanced thermal management system to optimise performance. This was combined with weight reductions to the transmission and steering mechanisms to maximise the overall fuel economy of the vehicle. On their first competitive run in London, the team recorded a result of 2,449mpg, nearly doubling the fuel economy from 2016. Over the following two days, the drivers continued to improve and the team made additional engine tuning and tweaks to the vehicle, resulting in a further record 2,938 mpg. Following a late change from the Race Director, the competing teams were allowed an extra competition run and the team completed a valid run, breaking the 3,000 mpg barrier with a 3,112 mpg result. Seb Habgood, Business Manager for Green Bath Racing said: “Working on Green Bath Racing has been a key highlight of my time at the University of Bath. I never thought I'd get the chance to design and manufacture an engine, assemble it into a high performance vehicle and compete at a European competition all within four months. The educational benefit of competing at this competition has been invaluable for further developing our knowledge and understanding of how different engine technologies and designs impact the vehicle’s performance. Academic tutor and Manufacturing Engineer in the University’s Department of Mechanical Engineering, Andrew Green, added: “I am really proud of the achievements of the Green Bath Racing students. Their hard work and dedication has been reflected on the race track, and being placed 8th in Europe and retaining their top UK title is testament to their efforts. The team is next competing at the UK Schools Eco-marathon at the Mallory Park Race Circuit near Leicester on 19 and 20 June where they hope to further improve their vehicle’s 3,112 mpg range.